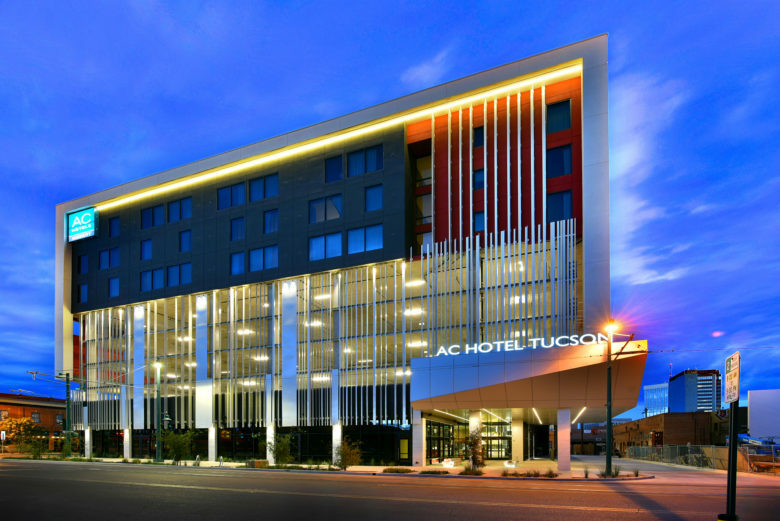 Swaim Associates in partnership with FORS Architecture + Interiors to design the AC Marriott Tucson is the newest hotel in downtown Tucson. This 136 room hotel features contemporary design of rooms and public spaces. The ground floor includes the main hotel lobby, dining, bar and meeting rooms. The ground floor also feature approximately 4,500 square feet of retail lease space. The next 4 levels are a 200 space parking garage developed with funding from Rio Nuevo. The sixth level includes guest rooms, fitness center and a pool and bar overlooking Broadway. Two more floors of rooms top out the high-rise structure at 8 stories. One of the first dozen AC Hotels approved by Marriott in the United States. This entry was posted on November 21, 2017 by swaim_admin.